BillyDroid is one of our latest themes for android enthusiasts. It is a freebie composed with tons of fully editable elements like sliders, menu bar with awesome effects on hover, social integration and all sorts of widgets. Works perfectly in every resolution (responsive!). Be sure to download and share with everyone you know, and keep coming back for more freebies! 52 people showed their love and said thanks, will you? Thank you for this awesome looking theme. This theme will work great for me on http://technologx.x10.bz keep on sharing man and keep up the good work! Thank you. We’re glad you liked it. Stay tuned for more content like this. Hi Omar, are you wondering whether the themes are supported on WordPress under Hostgator hosting? This i really great, which kind of hosting those this needs? 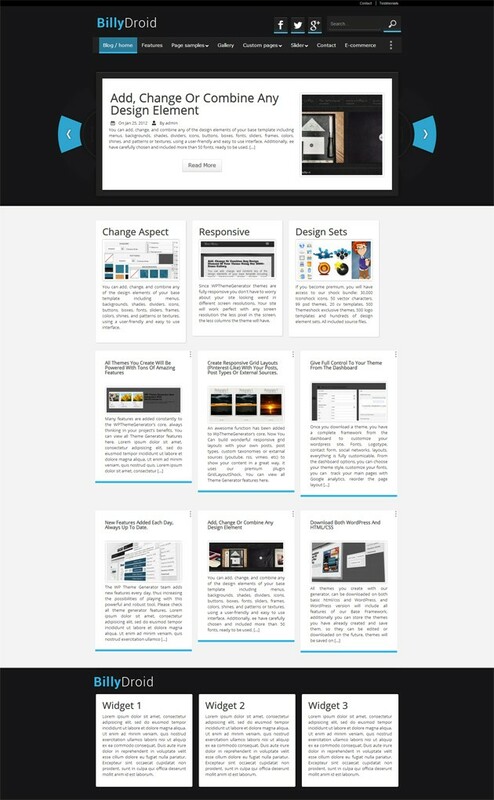 These themes are specially crafted to be used on hosting provided by WordPress. have not any ads widgets??? What do you mean by ads widgets? Hello, I liked your topic, and would very much like to know whether your Subject RUSSIAN LANGUAGE? Hi, the Android theme comes just in english by now. The menu items are only showing in alphabetical order. I have tried everything I know to get it in the order I want it to be. Can someone please help? Hi! Just go to your dashboard and create the menu the way you want it by going to appearance/menus. Be sure to check the last two options at the bottom of that section. The download gives an error message after I post the tweet. I’ve tried it both in Google Chrome and Mozilla Firefox. The error says something about the index.php file missing from the download system or something. that’s not support mobile themes? I would show my love, but I can’t download the freebie. It keeps asking for facebook or twitter sign ups. Its working, please try once more. Maybe with another browser. Amazing work guys. Just keep up the great work! Going to download without thinking. Espero utilizarlo en algún futuro Proyecto! De nada, Ojalá puedas hacerlo. Its working, please try once more. Great theme … keep on rockin’!! Olá, gostei muito desse tema, muito mesmo, baixei a versão disponível no repositório wordpress, mais ele me apresentou alguns problemas, como por exemplo, falta de resumo (Excerpt), leia mais (Read more), autor (Author) e botoes sociais (Social Buttons), outra coisa que não consegui foi mudar o fundo, fora isso o tema é muito bom, muito mesmo, estou pensando em usar ele no meu novo blog. Ps: Escrevi em português, por o tradutor muda muito o sentido do texto. Some things like the excerpt can be edited using the screen options on the posts page. other things like the read more can be achieved inserting the read more tag into the post. Some the features like the social bar may not be available. I installed the theme on wordpress 3.8 but it didn’t work, it showed only native element with white background, it didn’t look like the demo, even when I added the content. P.S : I used the free license theme. There could have been an error on download, please try it once more. Thanks! Been looking for this kind of theme for a while and now finally found a perfect one! I like it so much but how can I download it for personal?? Hello, i am about to download the free version of BillyDroid and test it for my online shop. If work good i will purchase the commercial licence. Before i do that i need to ask if you have any theme here i can use to handle my online store. The store will offer royalty free PSD templates so it will work just with digital goods.